Digital video disk or digital versatile disk (DVD) is a type of optical data storage medium capable of holding up to 17 giga-bytes (GB) of information. First introduced during the mid-1990s, they were developed as an improved form of compact disk (CD) technology. DVDs can produce such high quality pictures and sounds, they are expected to eventually replace both VCRs and CD players. It is anticipated that the market for DVD players will reach 10 million units by the year 2000. DVDs work much the same way as conventional CDs. Just like in a CD, the information is coded as a series of tiny pits in the disk. The pits are organized on a spiral track in a structure similar to vinyl records. By using a laser, these pits can be interpreted as binary code. When a smooth surface is read, the machine interprets the data point as a 0. When a pit is encountered, the data point is read as a 1. However, the key innovation that makes DVDs superior to CDs is the laser used to read and create the pits. 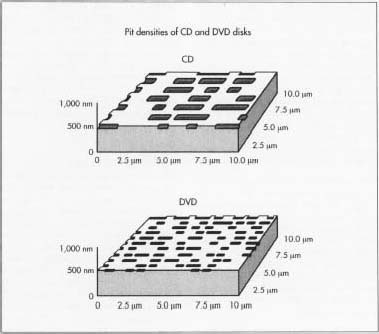 DVDs use a shorter-wavelength, red laser that can place pits more densely on the surfaces of the disks. This not only allows for more data, it also requires that the disks be only half as thick as conventional CDs. Consequently, two layers can be bonded together to create a double-sided disk which has the same thickness as a CD (1.2 mm). The DVD system has three features, which make it highly desirable including its high storage capacity, interoperability, and back-ward compatibility. In the early stages of DVD introductions, a single disk will hold as much as 4.7 GB of information. This is roughly equivalent to seven CD-ROMs. In future releases of this technology, a disk may hold up to 17 GB. This amount of storage space will literally change the way computer programs are developed and will allow for the inclusion of more video clips. The data format and laser used in DVDs will be the same for the computer players as for the television players. This will enable consumers to play the same disks in their computers that they play on their TV. DVD players will also have the ability to play current technology CDs. In this way, consumers will not have to buy replacement products for their current CD collections. DVDs can be used for a variety of applications including movies, audio systems, computers, and video games. Since the in-formation stored on these disks are electronic, the picture quality is estimated to be three times better than conventional VHS pictures. Additionally, the picture will not degenerate with age or use. Computer programs will also benefit from DVDs. For example, programs, which used to take up multiple CDs can now be condensed onto a single DVD. Video games will also benefit from DVD technology. Since DVDs offer high memory and interactivity possibilities, video clips can be included to enhance the playing experience. Developing the ability to store data for later retrieval has always been important. The first true data storage and retrieval systems were journals and ledgers. While they are still used today, they are slow, inefficient, and bulky. When the computer was being developed during the 1950s and 1960s, one of their main benefits was their ability to store and retrieve data quickly. This has now become one of the cornerstones of information storage and retrieval. Early computerized storage mediums included such things as punch cards, vinyl LPs, magnetic tape, cartridges, and magnetic disks. As computers improved, so did the data storage capabilities. In the late 1970s, the internal hard drive was introduced. Each of these data storage systems were developed to improve on the convenience and efficiency of the best storage methods available. Many of these systems continue to be improved on even today. The development of DVD began with the introduction by Sony of the CD in the early 1980s. This new storage medium employed a laser to read tiny pits carved in a disk. The first CD audio players were introduced in 1983. They were useful because it was possible to store more than 75 minutes of music on one disk. That was nearly twice what a vinyl LP could hold. While their acceptance was slow, the CD eventually replaced vinyl records as the preferred medium of choice for audio releases. Video CD players were introduced later in the decade. For various reasons, they never became popular enough to replace VCRs. The use of CDs in computers began during 1987. These devices were useful because they allowed storage of up to 650 megabytes (MB) on a single disk. Until then, the maximum storage on a magnetic disk was 1.3MB. Early computer CDs were slower than typical disk drives and were read only. Data transfer speeds steadily increased as did their capacity to write data. In 1994, 4X speed CD-ROMs (Read Only Memory) were introduced. In the next two years this was doubled. By 1996, 24X speed CD ROMs were available. Recordable CD players were first produced in 1996. Introduced in 1996, the multiple write CD was developed by Matsushita using a phase-change dual process. This uses a laser to change the reflective properties of the disk. Current CD-RW recorders can use this technology. As all these advancements in CD technology were occurring, researchers continued to search for ways to improve the storage capacity of these machines. Then, scientists discovered that by using a shorter wavelength laser, much more data could be packed on a single disk. This led to the creation of the DVD. In 1997, the first DVD players were introduced. These machines are slower than the fastest CD players and are not yet recordable. However, the next generation DVDs that are scheduled for release during 1999 will be faster and employ recording technology. Eventually, DVD is expected to replace VCRs and CD players. A DVD player is designed much like a CD player. For example, computer DVD drives are made the same size and shape as CD-ROM drives. They also have an outer plastic housing and come complete with plastic buttons on the front panel. Some DVD drives have a plastic tray, which extends out from the machine to accept disks. Others have an automatic feed system in which the disk is inserted. Inside the DVD drive, the electronics are also much the same as a CD-ROM drive. Both have sophisticated electronics and include a disk drive mechanism, a printed circuit board, and an optical system assembly. While DVD drive mechanisms come in various designs, each basically consists of a spindle that holds the disk and a motor that spins it. The circuit board contains all of the electronic components, which help convert the data being read into a usable format. 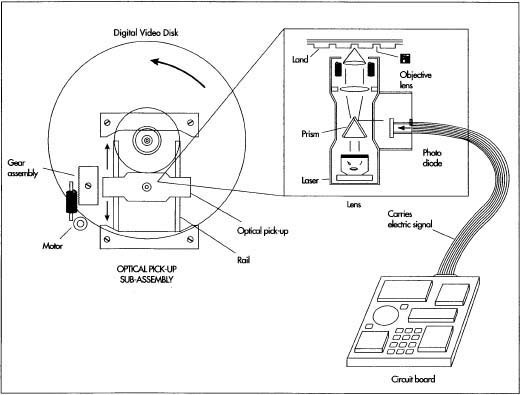 The optical system assembly is the part of the DVD that reads the data from the disk and transmits it to be converted into binary code. In a DVD machine, this consists of a redlaser diode, which has the ability to produce short-wavelength pulses. This is a low noise red laser producing light in the 600-650 nanometer (nm) range. It is much shorter than the 780 nm lasers used in conventional CDs. The other primary component of the optical system assembly is the photodiode, which receives the optical signal from the laser and converts it to an electronic signal. Highly polished lenses and mirrors make up the rest of the optical system assembly. A comparison of the amount of data a compact disk and a DVD disk can contain. DVD pit densities are much greater, allowing the disk to store at least seven times more data as a CD. reflective silver layer, the disk can be made to store 2 layers of data on one side. By using less power, the laser can read the data from the gold layer first and then by increasing the power, it can read the silver layer. This nearly doubles the capacity of one side to 8.5 GB. Eventually, a single double-sided disk will be able to hold up to 17 GB of data. Since DVDs were invented primarily for movies, a compression system is required. To do this, manufacturers have agreed to use the MPEG-2 (Motion Picture Experts Group) compression system. This is a system in which only the elements of the picture that change from frame to frame are stored. For audio, Dolby digital compression is used. Because both of these compression systems are used, a decompressor or decoder must also be included in the DVD player. Currently, this is a separate card that plugs into the computer. The decoder board processes data from the disk and sends it right to the computer's graphics and audio system. A variety of raw materials are used in the construction of DVD players and disks. Glass is used to make the laser and other diodes in the system. The primary components on the circuit board are made from silicon. Aluminum metal is used for the housing as well as a hard plastic. The base material of the disks is plastic. They are additionally coated with a silver colored layer and a thin gold layer. The surface of the disk is further coated with a hard layer of lacquer to protect it from damage. A DVD player is composed of sophisticated electronics, including a disk drive mechanism, a printed circuit board, and an optical system assembly. It consists of a spindle that holds the disk and a motor that spins it. The circuit board contains all of the electronic components, which help convert the data being read into a usable format. The optical system assembly is the part of the DVD that reads the data from the disk and transmits it to be converted into binary code. internal electronic circuit board and the disk drive mechanism. 1 The optical system is made up of a laser, photodetector, prism, mirrors, and lenses. The laser and photodetector are installed on a plastic housing, and the other components are placed in specific places. Great care is taken in the positioning of each of these pieces because without proper alignment, the system will not perform properly. Electrical connections are attached and the optical system is then ready to be attached to the disk drive mechanism. 2 The optical system is attached to the motor that will drive it. This in turn is connected to the other principle parts of the disk drive including the loading tray (if present) and the spindle motor. Other gears and belts are attached and the entire assembly is placed in the main body. 3 The electronic components of the DVD machine are sophisticated and use the latest in electronic processing technology. The circuit board is produced much like that of other electronic equipment. The process begins with a board which has the electronic configuration printed on it. This board is then passed through a series of machines, which place the appropriate chips, diodes, capacitors and other electronic pieces in the appropriate places. The process is done in a clean room to prevent damage that can be caused by airborne dust. When completed, it is sent to the next step for soldering. 4 A wave-soldering machine is used to affix the electronic components to the board. Before a board is put into the machine however, it is first washed to remove any contaminants. The board is then heated using infrared heat. The underside of the board is passed over a wave of molten solder and through capillary action, the appropriate spots are filled. As the board is allowed to cool, the solder hardens holding the pieces in place. 5 When all the components are ready they are assembled to produce the final product. The electronic board is hooked up to the rest of the machine and the main cover is attached. The DVD machine is then sent along to a packaging station where they are boxed along with accessories such disks, manuals, and power cords. They are then put on pallets and sent to distributors and finally customers. To ensure the quality of the DVD machines, visual and electrical inspections are done throughout the entire production process and most flaws are detected. Additionally, the functional performance of each completed DVD machine is tested to make sure it works. These tests are done under different environmental conditions such as excessive heat and humidity. They involve playing a test disk, which will produce specific electronic signals. Since most DVD manufacturers do not produce all of their own parts, they rely heavily on their suppliers for good quality. Most manufacturers set their own quality specifications, which their suppliers must meet. DVD technology is relatively new. There are many areas which will be improved in the coming years. Key developments for DVD include greater storage capacity, improved reader capability, and an increase in the number of movies available in DVD format. Currently, the most intensely studied area of DVD technology is increasing data storage capabilities. While the technology has already been developed to produce 17GB disks, some companies have found ways to store even more. A new encoding technique is being developed that can create a three-fold improvement in DVD storage. In this method, the pits made on the disk will have varying degrees of depth. This will allow the pit to encode for numbers from 0 to 8 instead of just a 0 or 1. It is anticipated that DVD devices using this technology will be available during 1999. Other storage mediums also show some promise. A new technology has recently been demonstrated that can hold up to 30 GB of data. This system uses red lasers and a magnetic field to retrieve the data. The use of blue lasers may allow for even greater storage capacity. Another area of improvement will be found in the ability of the DVD players to read two layers of information on a single side of the disk. Even though DVD players can theoretically read two layers of information both layers are rarely used because of its high cost. As technology improves however, this obstacle should be overcome and the full potential of DVDs may be realized. Currently, one the most inhibiting factors in the development of DVDs is the lack of a universal standard for storing and picking up media. This is similar to the problem that developed in the 1980s between VHS and Beta videotape players. In the near future, this problem should be resolved when major DVD manufacturers agree on a format. Williams, G. Compact Disk Players. TAB Books, 1992. Hogan, Dan. "I want my DVD." Current Science (October 3, 1997). Vandendorpe, L. "A Rose by Any Other Name Couldn't Hold This Much Data." R&D Magazine (July 1997). Poor, Alfred. "21st Century Storage." PC Magazine (January 21, 1997): 164.